"Satoshi Ohno: Prism Violet" at The Contemporary Museum takes its name from this two-paneled oil on canvas by the Japanese artist. The show runs through Nov. 25. 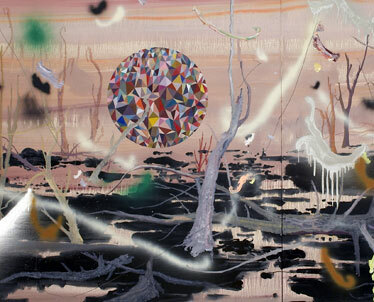 Satoshi Ohno displays his desire to be connected to nature with painstakingly detailed work that nonetheless bear a spirit of almost wild abandon, in "Satoshi Ohno: Prism Violet," on exhibit at The Contemporary Museum at Makiki Heights. 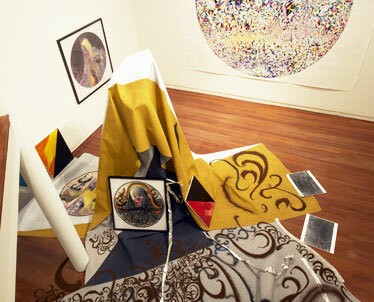 The artist's installation includes paintings and drawings of cedar trees (which reflect traditional Japanese art) and faces with long, cascading hair that represent Ohno himself. Incorporated into the works are intricate prisms, through which Ohno explores humanity's attraction to light. The centerpiece to the show are two mountain forms that reference Hawaii's volcanoes, a tribute to the landscape of the place of the exhibition. 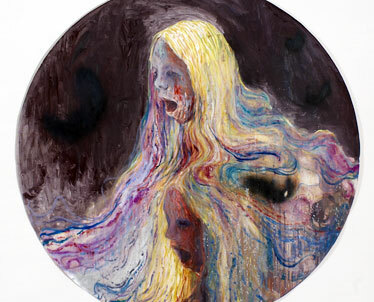 "Prism Violet" runs through Nov. 25 at The Contemporary Museum, 2411 Makiki Heights Drive. Gallery hours are 10 a.m. to 4 p.m. Tuesdays to Saturdays and Noon to 4 p.m. Sundays. Admission is $5 adults, $3 students and seniors and free to children 12 and under. Call 526-1322. Ohno built this mountain form, made with carpet over wooden structures, to reference Hawaii's volcanoes. The swirls are actual granules that Ohno poured in the gallery freehand during the installation.